Throughout the semiconductor manufacturing, engineers design integrated circuits and IC devices. This process of manufacturing semiconductors (commonly called ICs, or chips) can consist of more than a hundred steps. Our Temperature forcing systems and e environmental test chambers are an integral part of the final test process. MPI Thermal TA-5000 series state-of-the-art thermal testing solutions are changing the way thermal cycling tests of DUT’s are performed allowing semiconductor manufacturers to improve performance, reliability, and profitability through greater efficacy of manufacturing Semiconductor ICs and wafer testing processes. MPI ThermalAir Test Systems Brings Precise Temperature testing capabilities directly to the parts, components, PCBs, MEMs, MCMs, assemblies, and electronics. Our flexible, mobile thermal air forcing systems and benchtop test chambers provide a stream of hot or cold air directly to the test. ThermaAir provides engineers and researchers an accurate temperature controlled test environment capable of performing rapid temperature cycling in ther lab or on the production floor. Thermal Cycling Tests are used to to evaluate and predict Fatigue Life of Semiconductor Devices. These thermal cycle tests are repeated, cycling from high temperature testing ranges to a low temperature testing ranges to accurately predict the fatigue life cycle of a device through heat stress and failure analysis. Our Precision Thermal Stress Test Systems use a direct temperature-controlled stream of hot or cold air to provide a precise test environment for thermal stress testing, thermal conditioning and thermal cycling tests of electronic and non-electronic assemblies and sub-systems. 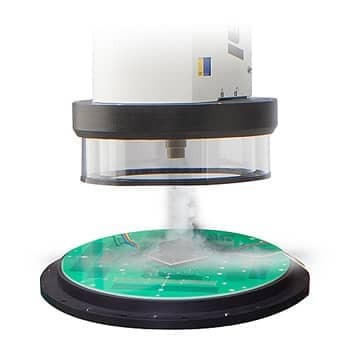 The ThermalAir Temperature system enables an accurate thermal cycling test, allowing you to perform temperature simulation tests in situ, at a specific location, at your tester station, test bench, or directly on the unit under test. Our portable self-contained thermal inducing systems only need to be plugged in and you’re ready for test, easily allowing fatigue life test of electronic semiconductor IC devices. Product and Test Engineers in the lab and on the semiconductor production floor use and share the ThermalAir thermal inducing stress cycling systems to bring their devices to temperature ranges from -55°C to +125°C in just seconds. ThermalAir environmental temperature test systems provide accelerated thermal cycling through a hot and cold air stream directly on the device under test (DUT). The ThermalAir TA-5000 has a thermal cycling test range from -100°C to +225°C without the use of Ln2 or CO2. ThermalAir Series of temperature testing systems and environmental test chambers play a critical role in determining product reliability by providing flexible thermal stress testing systems that provide a temperature controlled hot and cold air stream directly to the parts and electronics requiring environmental stress testing.